With sunset nice and early this time of year, one can begin observing after supper hour; just don’t forget to help with the dishes. Rising high in the north east is our Hero of the night. In last month’s article we saw how Perseus saved Andromeda moments before she was to meet her fate with the Sea Monster Cetus. When looking at Perseus, the brightest star to greet you is Mirfak (alpha Persei). The apparent magnitude for this F5 supergiant is listed as 1.75. However, even at its estimated distance of 590 light years, its absolute magnitude is -4.5. This means if Mirfak were 10 parsecs or 32.6 light years from us instead of its true distance, it would be as bright as the planet Venus. Mirfak’s surface temperature is around 6,500 degrees Celsius with a luminosity 5,000 times that of our Sun. It measures 64 times the Sun’s radius. Another star that is slightly fainter is Algol – aka the Demon Star. In mythology, Algol signified the Medusa. It holds the term Beta but with a twist. Algol is a very close eclipsing binary star system. A larger orange K giant star crosses in front of the smaller but brighter blue-white star. The magnitude range shifts from 2.1 to 3.4 over a very short period of only 2.87 days. If you have good weather, you can glimpse two complete cycles in a week. 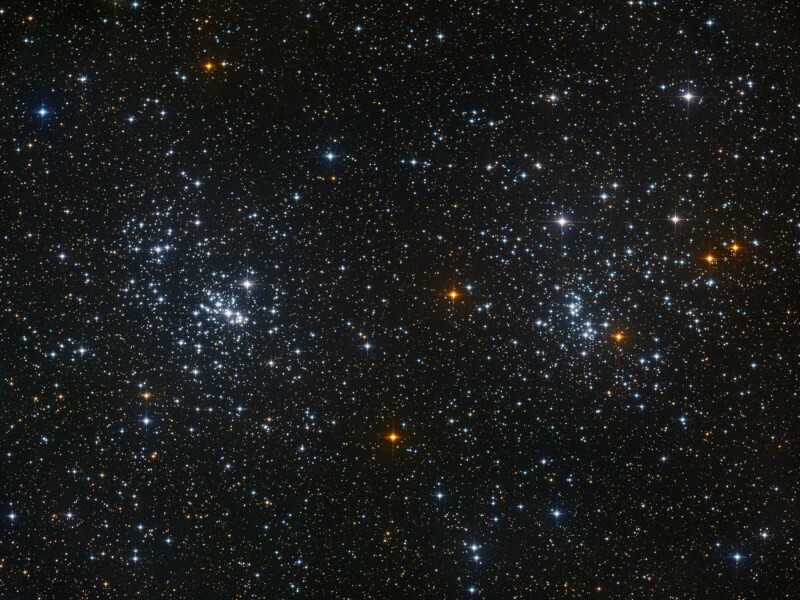 The famous Double Cluster is also located within the constellation’s borders. Glimpsed by the naked eye on moonless nights, binoculars or a telescope will reveal a wealth of bright stars appearing in side by side open clusters. These loose clusters catalogued as NGC 869 and NGC 884 are estimated to lie some 7,100 and 7,400 light years respectively. When glimpsed through a large telescope from dark skies, they take on the appearance of brilliant diamonds on black velvet. They squeeze nicely in a wide angle eyepiece. M34 is a rich open cluster. A little larger than the full Moon in area, it contains about 100 suns and is a naked eye object from the suburbs. This magnitude 5.2 swarm lies 1,400 light years from us and is thought to be 14 light years wide. Its age is estimated at 180 million years. NGC 1528 is another dense cluster of stars but just out of naked eye range. Now move your scope 2 degrees west and find NGC 1491. This is an emission nebula; commonly called a stellar nursery where new stars are forming is some 8,000 light years from us. For astrophotographers, the California Nebula is a good challenge. Rick Wagner of the Ottawa Centre provides us with a great photo below showing lots of subtle detail. Catalogued as NGC 1499, the California is also an emission nebula. It was discovered by E.E. Barnard in 1884 and resembles the state of California. It is about 1,000 light years from us. The Geminid Meteor is one of the most graceful displays of all showers. Moving at only 35 km/sec, you should have a chance to spot these meteoroids as they vaporize some 80 kilometers above us. Another bonus is the new moon occurs two nights after the peak so dark skies are a plus. The shower peaks on the night of the 13th and 14th when Earth passes through a stream of debris from extinct comet 3200 Phaethon. The annual count is usually 120 meteors but could be a higher. By contrast the Ursids only produce 10 meteors per hours on the night of the 21st. The elusive planet Mercury will reach its highest point of 20 degrees in the western sky on the night of the 18th. Be sure to look for it just after sunset. Moving up the ecliptic is Jupiter. On December 1st, the King of planets is 780 million kilometres from us and receding. At hat distance, its light takes over 43 minutes to reach us. A few events occur on the 21st. First look for Neptune one lunar width above Jupiter. Adding to the Kodak moment, a 23% crescent moon will be to the upper left. Also the planet Mars will become stationary in its orbit and appear to move westward against the stars. This dance is a tell tale sign that planet Earth is about to overtake the Red Planet in time for its closest approach next month. This will also be the night of Winter Solstice. We end off the year with all things – a Blue Moon or the second full moon in the same month on New Year’s Eve. The last time this occurred was in 1990 and will not occur until the year 2028. Well Christmas is just around the corner and you might be thinking of purchasing that special telescope for yourself or someone else. The telescope market has grown over the past decade with more automated, computer driven scopes, CCD cameras as well as numerous eyepieces and accessories. Of course we always want to save a few dollars but those department store cheap telescopes should not be on your list. Search for reputable telescope dealers that know what they their trade and can help you make that difficult choice. This could be a once in a lifetime purchase. You also contact your local Centre members for their advice.